A Cape Town Rhodes Memorial tagged image from photographer – Tim Evanson as published on Flickr. Neon artwork titled "The Glory of the Chinese Descendants" by Foon Sham, an artist from Virginia. Located at the 7th and H Street entrance of the at Gallery Place-Chinatown Metro station in Washington, D.C., the artwork is is made out of sealed wood, frosted plexiglass, and neon. Funded by Metro and the D.C. Commission on the Arts and Humanities, the artwork is a memorial to the people of Asian descent who settled D.C.’s current Chinatown. The Gallery Place station opened on December 15, 1976. The Red Line from Farragut North to Rhode Island Avenue was the first segment of Metro to open, and did so on March 27, 1976. Gallery Place opened nine months late due to a lawsuit over the lack of handicap access. The Yellow Line platform opened on April 30, 1983. Green Line service began on May 11, 1991 (although at that time the Green Line consisted of a three-station run from Gallery Place to U Street/Cardozo). "Chinatown" was added to the station name in 1986. 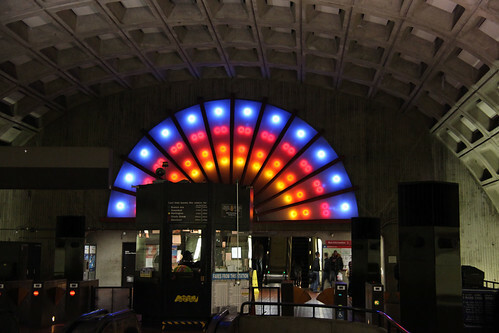 On November 3, 2011, Metro’s Board of Directors voted to strip the station of the "Chinatown" name, and return the name to just "Gallery Place."